The Source Code Editor provides many useful features for editing raw HTML, like syntax highlighting and line numbering. 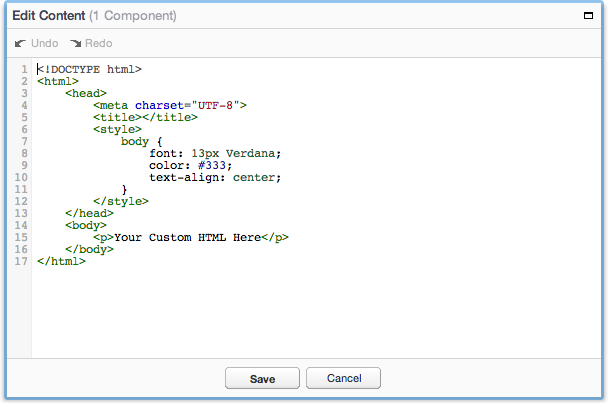 It is used to edit the content of HTML components. To open the Source Code Editor, double-click an HTML component on the canvas. The Source Code Editor opens in a pop-up window. When you are finished, click the Save button to save your changes, or the Cancel button to discard them. Upload the file to your project library as an asset. Right-click the asset, and choose Get URL from the context menu. Use the URL in a script tag, like above.